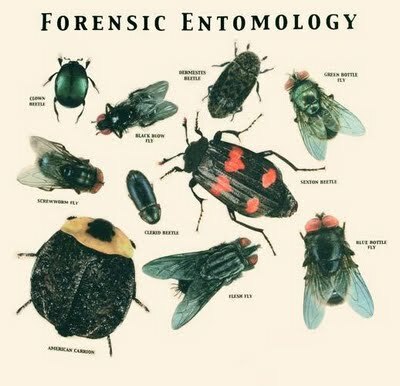 forensic entomology – All Things AAFS! 26/08/2013 by All Things AAFS! Quick Tips: Forensic Entomology – An Introduction. What is forensic entomology? It is a discipline within forensic sciences where specialists use information that they know about insect lifecycles and behaviours to interpret evidence in a legal context, relating to humans and animals. Entomologists don’t just stick to insects; their work can expand to include other arthropods, mites, spiders and macro-invertebrates. What information can we learn from insect activity? Insects are everywhere and can hardly be avoided, so it’s no surprise that sometimes they get mixed up in the evidence left behind – making them extremely valuable to an investigation. Insects can be a vital part of forensic science as they can provide a time and date to a crime or even a geographical position to where it happened. As some insects only become apparent during certain months, they can become a biological calendar for when a crime might have been committed. As well as being a biological calendar, certain insect species are only native in specific countries or hemispheres. This can be used to create an ‘X marks the spot’ on where a crime was committed – even if a body was moved/buried. Because of this, insects can be the key to past and present events as well as the future. Necrophages, which feed only on the decomposing tissue of the body or body parts. This is the category that blow flies, hide beetles and clown beetles are classed under. Predators of the necrophages – for example the rove beetles and ground beetles. Omnivores that consume both the live insects inhabiting the corpse and the dead flesh – ants and wasps. Opportunist species, which arrive because the corpse is a part of their local environment. This is where mites, hoverflies, butterflies and occasionally spiders are classified. Insect infestation in urban contexts. Neglect – either animal or human (elderly and children). Insect infestation of a body – living or dead. Death in which foul play is suspected.